The Modular Wet-Floor system is a unique concept in wetroom technology that can be used in a number of configurations to create a wetroom on a timber floor.The system is versatile and cost effective and can be installed with the linear drain in either the centre of the shower area, or neatly positioned against the wall. Consisting of three main elements, the Modular Wet-Floor is simple to configure. 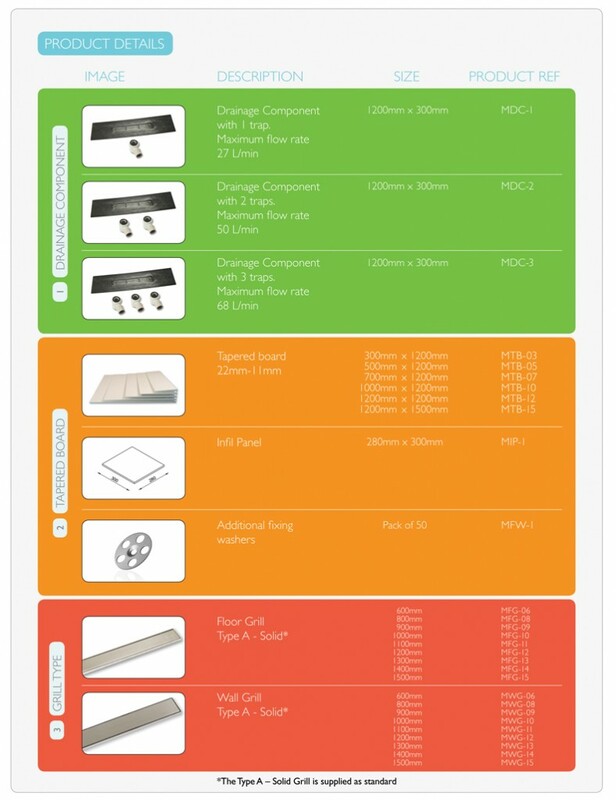 Start by selecting the required number of Drainage Components and Tapered Boards, then simply choose the appropriate Floor or Wall Grill to suit your wetroom layout. The Drainage Component and Tapered Boards can then be easily trimmed on-site, making the whole system quick and easy to install. 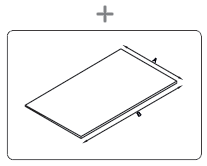 Tapered Board and Trims: Select the required number of tapered boards and appropriate trims. 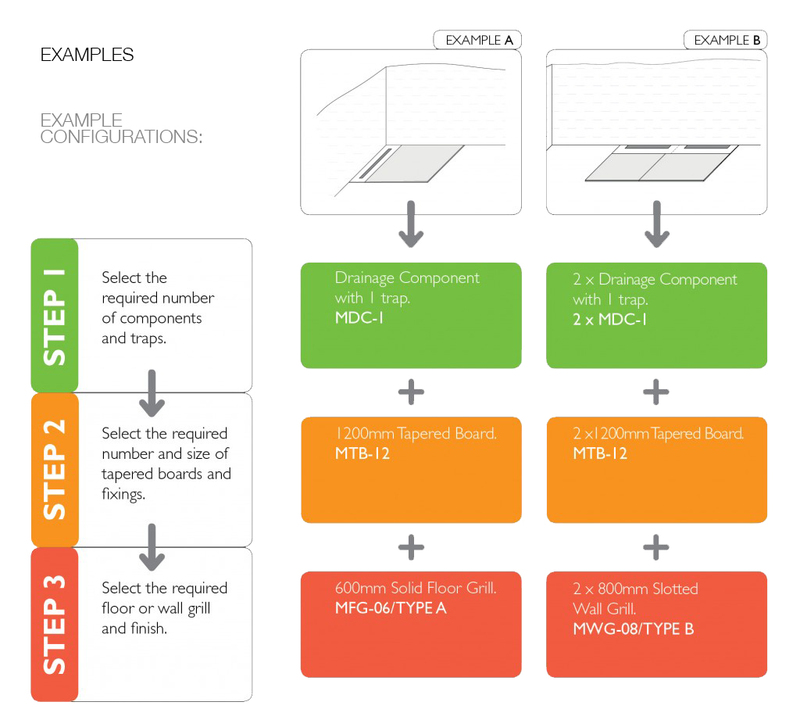 Floor/Wall Grill: Select the appropriate floor or wall grill (s). Manufactured from tough ABS plastic, the Drainage Component is the central element of the Modular Wet-Floor system. Once its position has been decided, the remainder of the system is built around it. Forming a base for the Linear Drain, the Drainage Component has a 1mm gradient towards the centre and can be installed in either an offset or central position within the shower area, or neatly up against the wall to create a sleek and unobtrusive wall drain*.The Drainage Component can be easily trimmed by up to 200mm off each end using a hand saw and is secured using the pre-drilled screw ports. 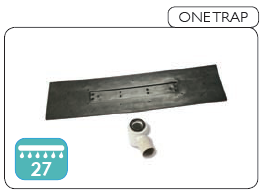 Two Drainage components can also be butted together to create a larger wetroom area. The drainage component and Tapered Boards can easily be trimmed on site. A single trapped Modular Wet-Floor has a flow rate of up to 27 L/min (see flow chart for full details). 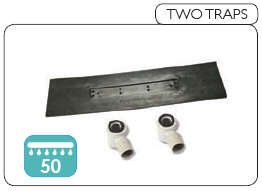 When a higher flow rate is required, a double trap version is available allowing up 50 L/min. For higher flow rates, a third trap can be installed giving up to 68 L/min. The Tapered Boards are manufactured from XPS foam with a mineral coating, making them both lightweight and easy to handle, whilst maintaining good thermal properties and compressive strength. Each board is 1200mm wide and tapered from 22mm to 11mm, giving a consistent gradient every time. 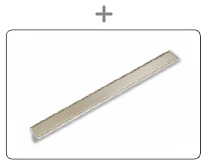 Available in six lengths, the boards can be easily trimmed to size using a hand saw and should be secured with the fixing washers supplied, at a minimum of 300mm centres. 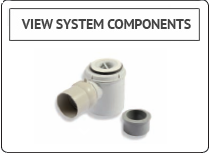 The system is designed with versatility in mind and can be installed in a number of different configurations. Click Here for the most common layouts. Using a combination of boards, either a one way fall towards the wall, or a two way fall with a central or offset drain can be created. Two or more Tapered Boards can also be butted together to create a larger wetroom area. 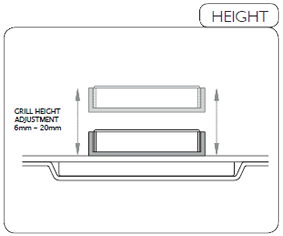 A 280mm x 300mm infill panel is available for use in certain configurations. There are two types of grill available within the Modular Wet-Floor system, both are designed to fit onto the Drainage Component. 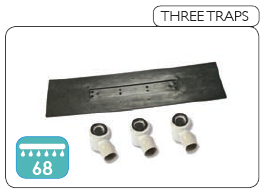 The Drainage Component is manufactured with one trough size at 660mm, all lengths of grill are then fitted onto this trough. The grill is available in nine standard sizes; two grills can be butted together to create a larger wetroom area (excluding 600mm grill). Bespoke grills can be manufactured for sizes in between and over those that are standard. Please contact our technical team to discuss your requirements. The Modular Wet-Floor Grill is available in nine standard sizes: two grills can be butted together to create a larger wetroom area (excluding 600mm grill). 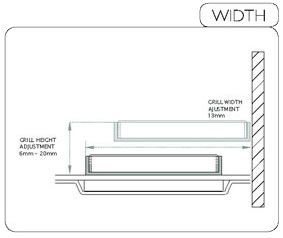 The grill is height adjustable in 1mm increments to suit tile thicknesses of 6mm to 20mm. Additional spacers are available upon request for tiles thicker than 20mm. 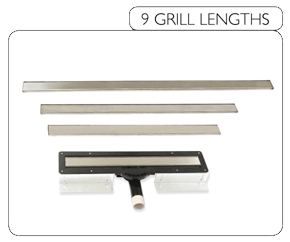 The Wall Grill is width adjustable to allow for different wall tile thicknesses. The grill is available in various different finishes. All are manufactured in 316 marine grade stainless steel, ensuring a stunning high quality finish. 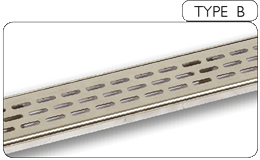 Type A Solid Grill is supplied as standard unless otherwise specified. Type A – Solid Grill: Grained stainless steel with a 5mm gap around the grill for a sleek stylish finish. 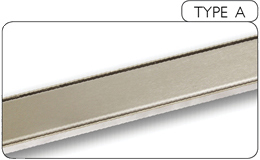 Type B – Oblong Slots: Three rows of oblong slots in a grained stainless steel finish. 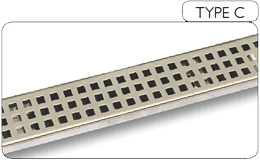 Type C – Square Holes: Three rows of squares in a grained stainless steel finish. 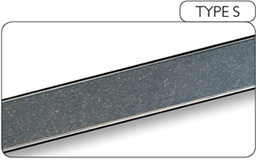 Type S – Stone-Infill: Allows a section of tile to be inserted to provide a sleek continuous look. Suitable for 10-12mm stone/porcelain tiles. Bespoke depths available to order. Step Select the required number of Drainage Components. 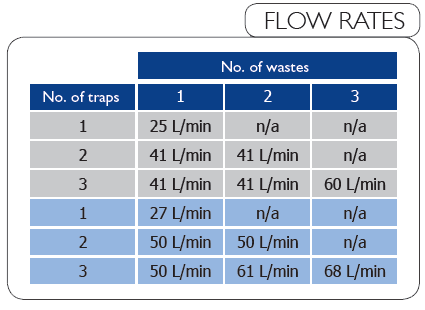 Establish the flow rate required & select the appropriate number of Traps required to achieve this flow rate. Note: The Drainage Component and Tapered Boards can be easily trimmed on-site. Two Drainage Components and Grills can be butted together to create a larger wetroom area. For timber floors we would recommend the RIW Tilesafe membrane is applied to the entire wetroom floor. RIW FWM should then be applied to the walls of the shower area, plus an additional 300mm and overlapped onto the RIW Tilesafe Reinforcing Tape.